It has 8 comfortable rooms, good facilities, each individually designed and lovingly furnished, including AC, TV and minibar. From the arcade, you overlook the whole area and the pool. 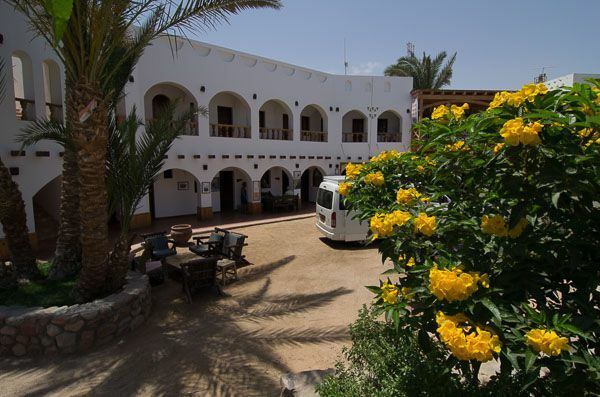 The Moses-House with its beautiful inner court is located in the same area about 50m away from the hotel building. 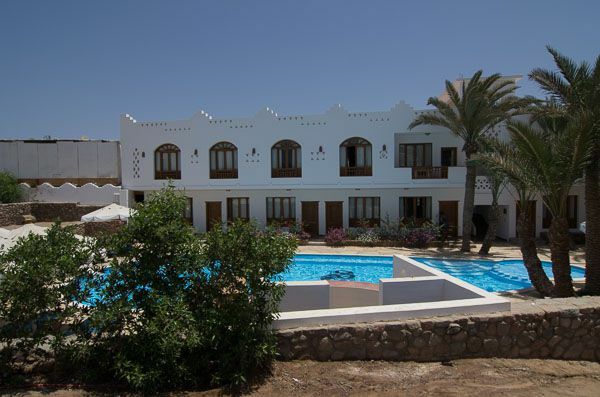 Groups up to 10 person will appreciate the isolation from the hotel with almost the same comfort of the rooms. Our guests sleep in tents either their owns or in one of our tents. Of course you can sleep under the open sky. Our employees take care of the kitchen and the tank fillings. Diver's Camp means full board and lodging. Not included are bottled water, softdrinks and alcoholics. Diving included! It‘s only a stone‘s throw from the hotel building to the seaside promenade and our special entry. If you are an experienced diver you can dive with us unstrained, because we accept all approved brevets of national and international diving associations. 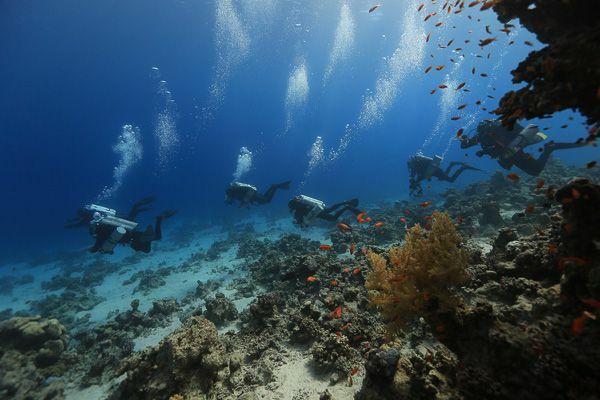 If you are a beginner you can take a dive course with one of our instructors. 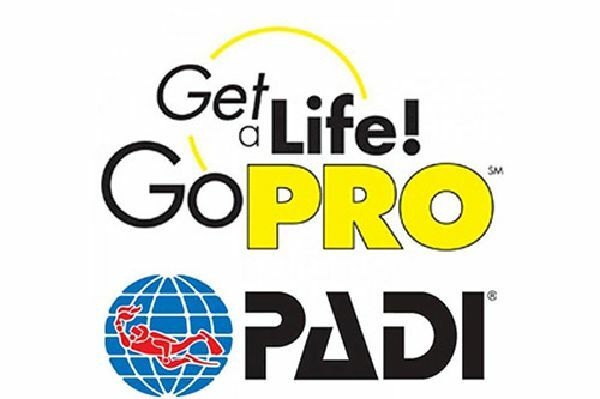 We offer all courses: PADI , SDI, CMAS. Our professional instructors will train you individually or in groups. Of course we offer all advanced dive courses also. Start with us from Bubblemaker to Divemaster. Technical diving is our passion! Dahab is the „Mecca“ of technical diving, scattered around the coast you will find some of the finest Tec diving sites on the planet. These include the world famous Blue Hole, as well as the Canyon, Bells, Tiger Canyon, TJ Canyon and the Abu Helal Canyon system. 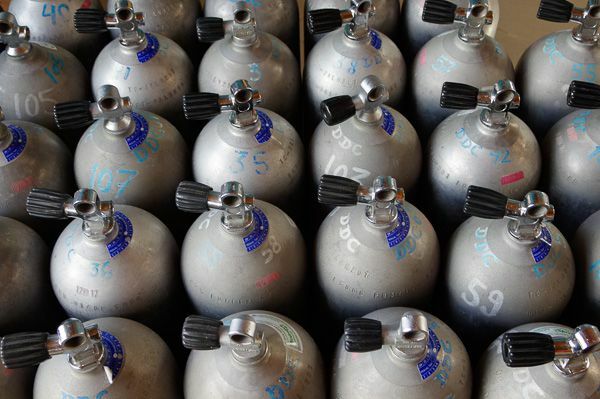 Our dive equipment is carefully maintained. For our guests we have more than 50 wet suits in different sizes, even for children, 75 12 liter alu tanks, BCs and all the other stuff you need. The tanks are filled with our Bauer V15 Super Silent Compressors. They are checked according to the rules of CDWS. Small repairs are easily done in our repair shop. The Sinai peninsula offers many scenic highlights. These can be reached either by a four-wheel drive vehicle or by camel. Be enchanted by the desert! 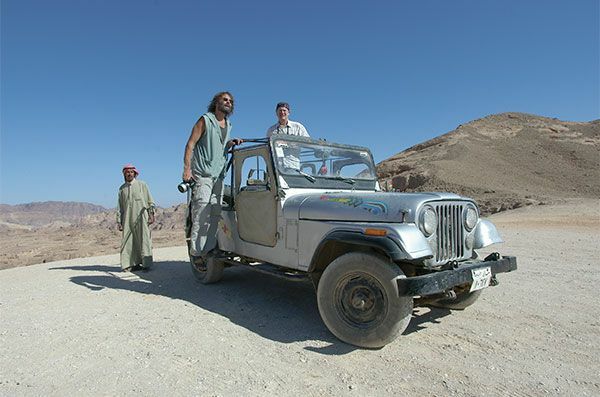 We organize off-road safaris to the most beautiful places on the Sinai Peninsula for one or several days. 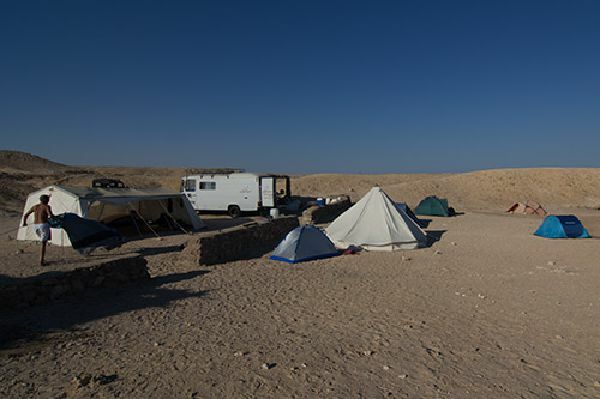 You decide whether to sleep outside in the desert or to stay the night in a safari camp. Our local guides know the desert. They organize food and drinks and cook your meals. 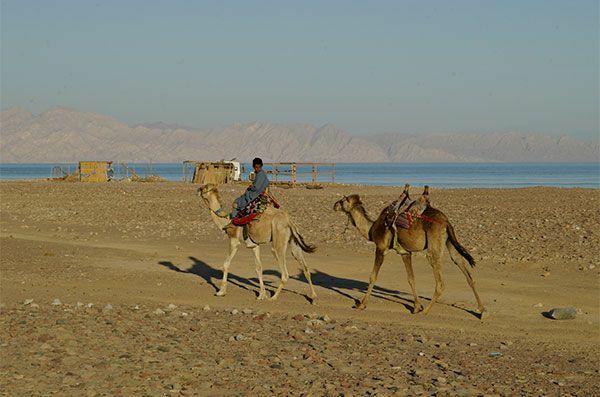 We organize camel trips to the most beautiful places of the Sinai Peninsula. 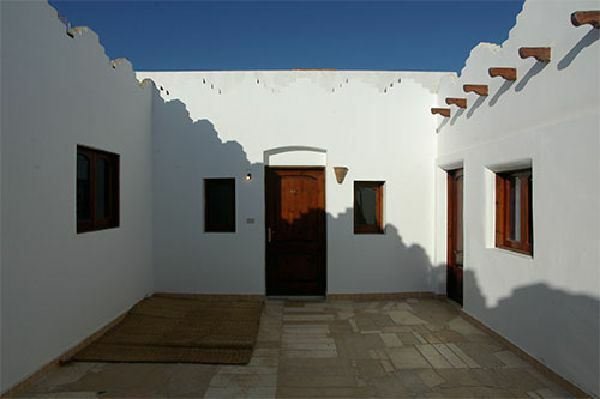 Our experienced Bedouins will guide you to lonely valleys, beautiful sandstone rocks, lost oases. They make fire, tea and fresh bread and cook a whole Bedouin meal for dinner. 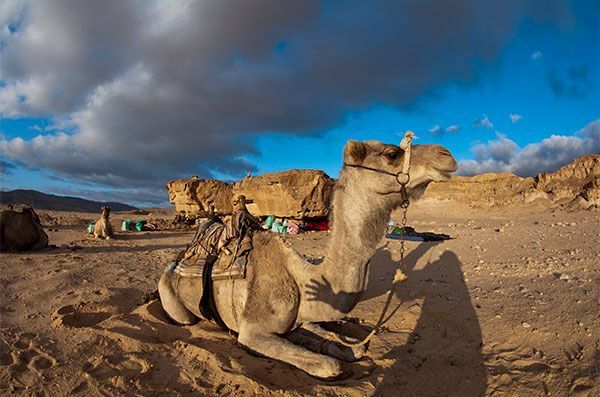 Well organized, a camel trip will be an unforgettable adventure. The Sinai Peninsula offers much more than just fantastic dive sites. The desert has its own charm and with little effort it can be explored. If diving is not all you want, or if your non-diving partner also wants to have some nice experiences, we can offer camel day trips around Dahab. If you are already in Egypt, have time enough and do not want to spend your time only with diving, may be a regional tour would be interesting. 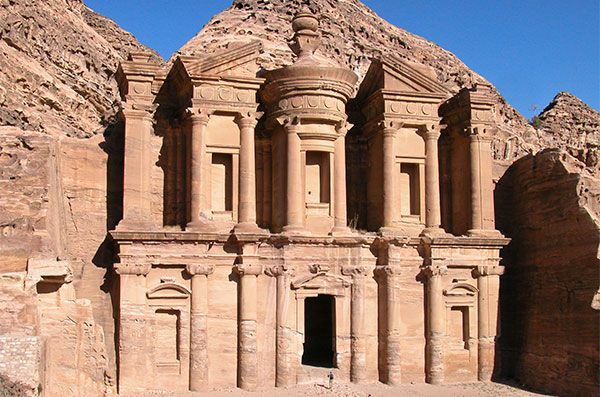 We can arrange every tour - Petra, Jordan, or to Cairo or Luxor. Tell us what you would like to do.